Fall seems to get foodies pretty excited. I can’t open a magazine these days without being sucked into the dappled, golden images of autumnal produce filling the markets and heartily agreeing about how great it is to crank up the oven after a long, hot summer of disuse (regardless of the fact that ‘hot’ and ‘summer’ are never used in the same sentence in Scotland… still, I get their point). I used to think that celebrating fall was simply a coping mechanism for dealing with the end of light and warmth and onset of everything cold, barren and dark, but recently I’ve had a change of heart. Either the magazines are having their intended effect on me or else I’m slowly gaining some wisdom in my old age (since that’s another thing fall brings me each year: a birthday), but lately I’ve started to see it in a different light. Now it seems perfectly obvious that more than any other season, when you pare fall down to its skivvies, it is all about the food. And what’s not to celebrate about that? You’d think I would have figured it out sooner. After all, no matter where I’ve welcomed in this season – in California, where it tiptoes into place so stealthily that you could easily miss it if not for the calendar, or New Orleans where it flushes out a heat-ravaged city like a welcome sigh of relief, or Germany where its crisp, icy sunlight renders the blue skies and Technicolor trees even more vibrant – fall has always possessed the uncanny ability to make me incapable of thinking about anything but food. It makes sense though, really, since this season has just about the perfect confluence of conditions for eating well. Not only are the temperatures dropping, boosting the metabolism and making us ravenously hungry, but the last of the harvest is coming in, providing us with a bumper-crop of things to cook, preserve, eat and share. Then, of course, there is our biology at work – that very biology that tells us, as mammals, that winter is coming and we need to pack on a little extra padding to get through it alive. Add to that the long, dark nights perfect for pottering around the kitchen, the plethora of food-centric holidays, and the fact that the bikinis and skimpy shorts are safely tucked away for the next nine months (and with any luck won’t cross our minds again until January 1st), and it’s hard to deny that fall truly is the appetite’s finest hour. So if you ask me, this really is what the magazines should be emphasizing. It’s not that the apples of fall are so much more delicious than the peaches of summer, or that mushrooms are inherently more satisfying than corn, it’s that we’re blessed with a season that couldn’t be more perfect for cooking, eating and sharing our table with those we love. That’s certainly enough to get me excited. In my ever-humble opinion, no one in Italy does fall like the Piedmontese. This mountainous region, after all, is the home of the white truffle, of wild mushrooms and chestnuts, of fonduta and bollito. I read about this Piedmontese hazelnut cake in Michele Scicolone’s 1000 Italian Recipes (an unspectacular title for a really exceptional book, well-researched and chock-full of unusual regional gems culled from the author’s extensive travels around the country). She claims to have eaten this cake in Piedmont with a side of poached pears, which seemed to me like a perfect match, but never one to leave well enough alone I decided to combine these two elements into one dessert, and threw in some Marsala for good measure. Its foundation is a dense, buttery cake, chock-full of nuts – and either rustic or refined, depending on how finely your nuts are ground – which is crowned with silky pear halves that were previously poached in vanilla and Marsala wine. If that weren’t enough, after the cake comes out of the oven, the pear poaching liquid is reduced to a syrup which is used to gently saturate the cake, providing a boost in sweetness, moisture and intoxicating fragrance, not to mention a beautiful sheen to the finished product. Note that if you have access to commercial ground hazelnuts (or ‘hazelnut flour’), you can use that instead of grinding your own. Toast the ground nuts in a dry skillet over medium heat, stirring frequently to prevent burning, until the nuts are golden and fragrant – just don’t let them get too dark or they will be bitter. Combine the sugar, wine, Marsala and water in a medium saucepan. Split the vanilla bean lengthwise and with the tip of a knife scrape the seeds into the pan. Add the vanilla pod and the pear halves to the pan. If the liquid does not quite cover the pears add just enough water so that it does. Bring to a simmer over medium-high heat, reduce to medium-low, and simmer, uncovered, until the pears are tender when pierced with a knife, about 20 minutes. Remove from the heat and let cool to room temperature. Preheat the oven to 350F/175C. Grease a 9-inch (23 cm) springform or cake pan. Toast the hazelnut for about 10 minutes, or until fragrant and the skins have split. Remove and cool. Rub the nuts in a towel to loosen as many skins as possible. Place the skinned nuts in a food processor and pulse until finely ground, but be careful not to turn it into a paste. Add the flour, baking powder and salt and process to combine. Beat the sugar and butter together in a medium bowl until fluffy. Add the eggs, one by one, beating well after each addition. Fold in the nut mixture just until combined. Spread the batter in the prepared pan. 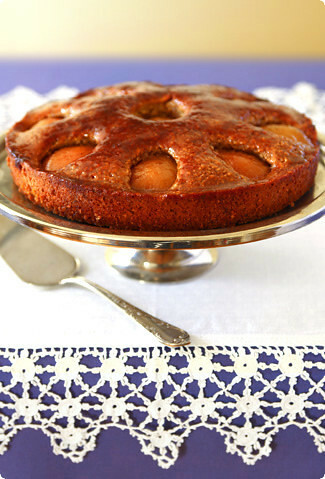 Drain the pear halves (reserving the liquid), and arrange them in a symmetrical pattern on top of the cake. Bake for 30-40 minutes, or until a toothpick inserted near the center comes out clean. Remove to a cooling rack. While the cake is baking, return the pear liquid to a boil over medium-high heat. Continue to boil until the liquid has reduced to approximately 1/2 cup (125ml). Remove from the heat. When the cake has emerged from the oven and still hot, brush or drizzle the syrup over the top of the cake, waiting until each coat is absorbed before doing the next one. Cool the cake completely and serve with a mound of softly whipped cream. Yes, autumn is a food season but then all of them are when I come to think of it. And it gets worse the older I get! The cake is brilliant, it gave me the inspiritation I need so badly right now! Thanks Melissa! This cake radiates the deep, rich colors of fall and the pear syrup glaze makes it look so decadent and delicious ! Fall is a wonderful time to be in the kitchen making some delicious, comforting food, isn’t it? I’m overflowing with ideas for tarts and pies, yours is just the perfect expression of fall! Melissa,Isn’t it interesting how our view of the fall changes. I never remember particularly liking the season and yet as I get older, it becomes more and more important as a time to enjoy the best food in particular.I agree with you wholeheartedly about the Piedmontese!A beautiful cake! This looks and sounds like an absolutely glorious dessert. I’ve been cooking and baking up a storm — it’s that fall thing, definitely — and this is going on my must-make list. GOSH DAMN MELISSA!!!!!!!!!!!!!!! !Your writing gets me going I swear!!!!!!!!!!!!!!!!!!!!!!!!!!!!!!!!!!! !I haven’t even made it to the recipe yet, I just can’t get past your words and how eloquently you described the season so well.I CAN’T STAND IT!!!!!!!!!!!!!!!!!!!!!!!!!!!!!!!!!!!!!!!!!!!! !Mark my words – I shall be the first person to buy your book. What a beautiful photo, and a gorgeous cake. Hazelnuts-I love them in all their guises-this sounds and looks a winner.Apart from my foodie/harvest response to fall, I love the look and smell of the season. Here in the mid-Atlantic states, besides the riot of leaf color, the light seems different. It could be my imagination, but it seems as if, for whatever reason (angle of sun to earth, maybe? ), the light is a cooler, bluer color, and makes everything look wonderfully clear. There is a sharpness to the smells as well.And these days we spend so many years of our lives in school of one sort or another-autumn always seems a season for the beginning of new things.Do you have a favored kind of pear? I like them all, but to me, Bartlett (called William, I think, in France) are the peariest and most delicious. Melissa – What a lovely rendition of the fall season’s charms. Wow!! That’s gorgeous. And here I thought I was hot stuff for making pear muffins this weekend. I bow to your fabulous pear cake. It’s superb. Dear Melissa, Happy Birthday! May the year ahead be even more fabulous and delicious than the last!That cake looks mighty fine, but seeing as you made this last week,I seriously doubt there’s any left for today 😉 Which, of course, makes it the perfect reason to go check out another of those autumnal recipes you’ve certainly put me in the mood for, despite the fact that the weather in these parts right now is no different than it is any other time of the year! Thank you for reminding me of why I like fall. It IS all about the food! Pear syrup reduced and drizzled on cake? That sounds like perfection in a mouthful. Was this your birthday cake this year? Many happy returns! What a lovely looking cake! Just too pretty to eat (well maybe we can eat it after all) 😉 I can imagine the moist inside from the fruit….yum! What a wonderful cake! You’ve inspired me to make one myself! Hi Melissa,Yes I do still keep up with your site since we met this summer. You hit one of my favorites with this last one though – ripe pears simmered in liquor – how can you miss. You’ve captured one of the essences of fall – even for us here in the Pacific Northwet. This would be a worthy way to close a dinner of fresh caught fall run salmon. Nicely done and congrats on the F&T article. Gorgeous cake! Do you think I could use ground almonds instead of ground hazelnuts? Can’t wait to try this recipe! Jennifer – Sure, I don’t see why not. I think it’d be great, just as long as you toast the almonds first, since that’s what provides so much of the flavor!